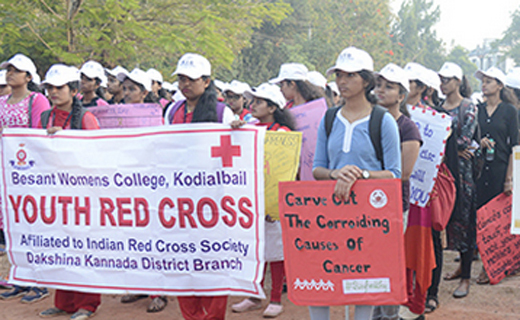 Mangaluru, Feb 04, 2019: A Walkathon from Balmatta to the Mangaluru Institute of Oncology premises at Pumpwell was organised on February 4, Monday by the MIO with the objective of creating awareness about cancer. Dr Anantha Krishna, President of MIO flagged off the marathon which was organised on World Cancer Day. He said the Walkathon has been organised to sensitize youth and students considering the fact that the number of cancer cases were increasing by 1.81 per cent every year and the disease was claiming 9.7 million lives every year. Dr Jalaluddin Akbar, Director of MIO, Dr Sanath Hegde, Chief Operating Officer and others were present.